This statuette depicts the Buddhist deity White Tara who is the consort of Bodhisattva Avalokitesvara. She symbolizes perfect purity and is believed to represent transcendent wisdom. The deity is also considered as the special goddess of long-life and helps devotees to overcome obstacles, grants wishes and protects them from danger and distress. It is generally believed that her complexion is white as she is an incarnation of the Chinese wife of the Buddhist king srong-tsang-sgam-po who was of white complexion, but scholars generally believe that artistes probably followed the Chinese custom. 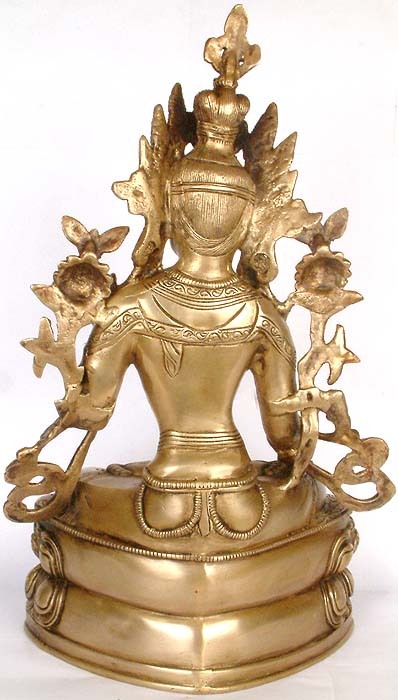 She is seated in Padmasana on a lotus throne and has two hands: the right hand is in the gesture of charity (varada) and holding a flowing stem of full-blown lotus flower, while left hand is in the gesture of abhaya or argumentation and also holding the stem of a half-blown lotus flower. This signifies that the White Tara symbolizes all aspects of a blossoming femininity. The figure has a smooth, slim and slender body. The eyes are half-closed and there is a sacred circle between the eyebrows. The facial expression shows serenity, calm and compassion. Her hair is partly upswept in knots and partly falls on her shoulders. The goddess is adorned with a five crested crown, earrings, necklaces, a sacred- thread, armlets, bracelets, a waist-band and anklets. The upper portion of the body is bare except for the ornaments. The skirt covers the body upto the feet. The border of the garment is incised with floral designs. She has more than two eyes which are visible on both the palms and soles. She grants immaculate wisdom, learning, contemplation, and meditation and is extremely popular in Tibet, Mongolia and Nepal. The Ceremonies of Tara are an integral part of Karmapa rituals. Her mandalas are worshipped from the third to the ninth of every month and on auspicious days there are special services to White Tara. This description by Dr. Shailendra Kumar Verma, Ph.D. His doctorate thesis being on the ""Emergence and Evolution of the Buddha Image (from its inception to 8th century A.D)"
Alice Getty, The Gods of Northern Buddhism, Tokyo, Japan, 1962. P. Pal, Art of Himalaya Treasures from Nepal and Tibet, New York, 1991.